In the previous post, we spoke about the vice of pride as the principal enemy of love for God and our neighbor. Now it’s time to speak about the virtue of humility. St Augustine says: “IF YOU ASK ME WHAT IS THE ESSENTIAL THING IN THE RELIGION AND DISCIPLINE OF JESUS CHRIST, I SHALL REPLY: FIRST HUMILITY, SECOND HUMILITY AND THIRD HUMILITY” (Letter 118). Why? Because HUMILITY IS THE FOUNDATION, THE BASIS OF ALL VIRTUES, including that of love. HUMILITY IS THE FOUNDATION OF LOVE, THE HABITAT OF CHARITY. The Lord is near to contrite hearts, so ready to defend the humbled spirit (Ps 33:19). The publican stood far off: he would not even lift his eyes up towards heaven; he only beat his breast and said, ‘God, be merciful to me; l am a sinner’. The Lord who flouts the scornful, and gives the humble man his grace (Jas 4:6). “LEARN FROM ME, FOR I AM MEEK AND HUMBLE OF HEART”, Our Lord Jesus Christ said. OUR LORD JESUS CHRIST ASKS FROM EACH ONE OF US TO IMITATE HIS HUMILITY. “Let the same mind be in you that was in Christ Jesus, who, though he was in the form of God, did not regard equality with God as something to be exploited, but emptied himself, taking the form of a slave, being born in human likeness. And being found in human form, he humbled himself and became obedient to the point of death— even death on a cross” (Phil 2: 5-8). His Humility in the Sacrament of the HOLY EUCHARIST, where He transforms the bread and wine into His Body and Blood so that we could receive Him in Holy Communion; and in the TABERNACLE, enclosed, “imprisoned” so that we could approach Him easily whenever we want with the proper dispositions! Our Lord loves us with a love so immense, willing to SURRENDER and FORGET HIMSELF for our sake; disposed to SACRIFICE AND EMPTY HIMSELF, until the last drop of His Blood for love of us; TOTALLY GIVING HIS LIFE for our happiness and salvation; ever ready to SERVE each one of us, taking upon Himself all the burden of our sins through the Sacrifice on the Cross….ALL THESE WERE POSSIBLE BECAUSE OUR LORD WAS HUMBLE! 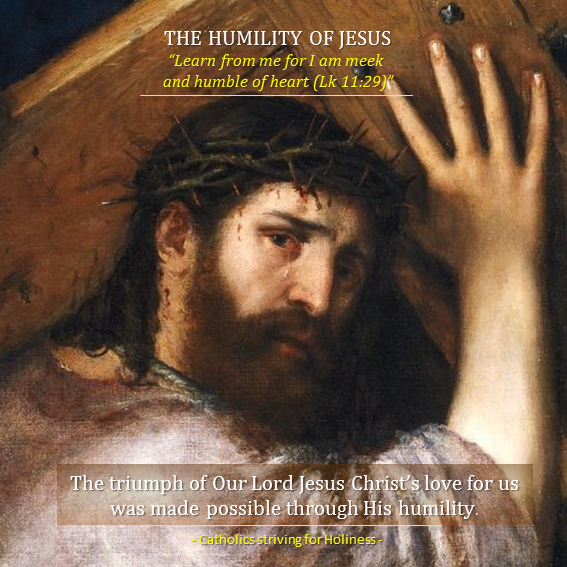 THE TRIUMPH OF OUR LORD JESUS CHRIST’S LOVE FOR US WAS MADE POSSIBLE THROUGH HIS HUMILITY. Dear friends: let us THANK Our Lord for everything He has done out of love for us. Let us never forget that THE TRIUMPH OF GOD’S LOVE WAS MADE POSSIBLE THROUGH HIS HUMILITY. He calls each one of us: “Learn from me for I am meek and humble of heart” (Lk 11:29). Let us ask the God the Holy Spirit, through the intercession of Our Lady, Spouse of the Holy Spirit, for the virtue of humility and at the same time firmly resolve to forget ourselves, think more of the others, serve the people around us, and put God and others as the center of our life.